The public has spoken. They want safe, accommodating streets. MOTHER NATURE may be attempting to reclaim the Southside. That’s one of my takeaways from a May 16 meeting at the Armstrong Center during which residents described raccoons peering into windows, armadillos tearing up yards, and birds taking control of a city park. Deer, snakes, and rats were also listed among animals behaving badly in District 6. Varmints of another sort were drawing the ire of one citizen, who noted that a swarm of bros had infested a home on her street. It’s operating as a de facto fraternity house, she explained. 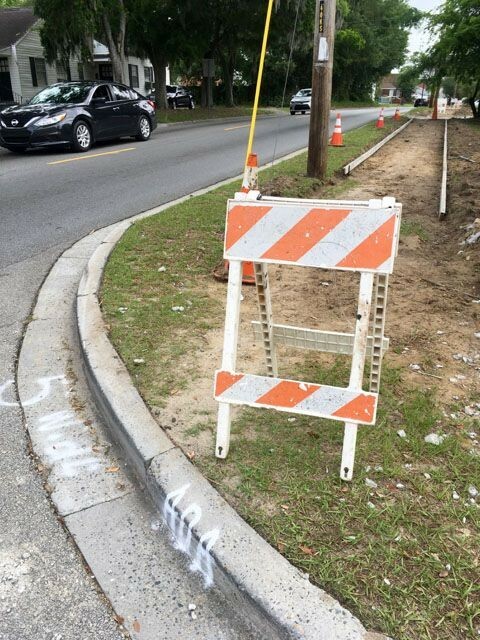 If city officials incorporate citizen input gathered at Savannah Forward meetings this month in the strategic plan, sidewalk construction like this underway on Waters Avenue will be a more common sight in Savannah. The complaints about animals and Animal Houses seemed to be unique to District 6. But other concerns proved common in meeting after meeting. People stood up and spoke about the critical need for sidewalks, bike lanes, and traffic calming in their neighborhoods. In fact, the very first comments voiced by citizens at the very first Savannah Forward meeting, held May 2 in District 3, were pleas for safer streets for walking and biking. At the final meeting on May 18 (District 1), residents shared their worries about speeding cars and trucks. And at every meeting in between, people demanded safer streets, serious measures to slow motor vehicle traffic, better connectivity between neighborhoods, and more mobility options. This comes as no surprise to Healthy Savannah’s Paula Kreissler. Nor is this news to Brent Buice. 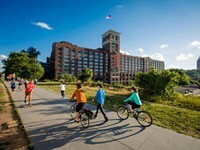 During his tenure as executive director of Georgia Bikes, he commissioned the firm Public Opinion Strategies to poll likely voters in five Georgia cities, including Savannah. The survey also found that 87 percent of survey participants in Savannah favored investment of their tax dollars in these improvements. 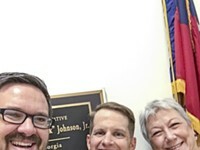 Buice is now the Georgia and South Carolina coordinator for the East Coast Greenway Alliance. 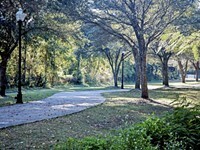 He said it’s understandable that Savannah residents also want trails, multiuse paths, and other connections between neighborhoods that can be used both for recreation and transportation. There were other concerns aired in the meetings, of course, and they are the topics discussed in coffee shops and at dinner tables all over Savannah every day: Crime. Drainage. Blight. Poverty. But even in these concerns, careful listening to comments from citizens unveiled multiple layers. Residents said they need police presence in their neighborhoods, but they want to see officers patrolling on foot or on bikes. Recreational amenities suggested as a way to steer young people away from crime were coupled with requests for accessibility. Just as surely as Jeremy Stephens, the affable facilitator, drew chuckles at the beginning of each meeting by explaining how to pronounce the name of his Tennessee hometown (Locals insist the “y” in Maryville is silent), residents reliably expressed their desire for walkable, bikeable, connected neighborhoods in every single meeting. Although they described their visions in different ways, their message was unmistakable. Intensifying concern about streets configured to encourage speeding was also easily detectible. A District 6 resident said she was so afraid of speeding in her neighborhood, she was fearful just walking to her mailbox and back. District 2 residents demanded traffic calming on Henry and Anderson, along with Whitaker and Drayton streets. 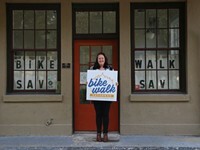 The Savannah Forward meetings affirmed strong support for streets that are safe and accommodating for all people, no matter their mode of travel, no matter where they live in Savannah. If city officials needed further justification for prioritizing sidewalks, bike lanes, and traffic calming in the strategic plan, there’s no doubt they now have it.